The Manners is ideally situated just a few minutes walk from all of the delights Bakewell has to offer. Enjoy a freshly cooked meal in our restaurant, relax in the beer garden then have a good nights sleep at The Manners followed by a delicious continental breakfast the next morning. Prices start at £95 per night and for and extra £10, you can even bring a well behaved dog. With a decor of lavender, deep purple and tartan, inspiration was taken from the nearby Haddon Estate family seat of Lord Edward Manners, and namesake of the pub. Double bed and en suite bathroom with over bath shower. Not only are the walls a soft shade of pink in this room, so is the lovely bathroom suite. We love the retro feel of this bathroom and couldn’t bear to take it out. 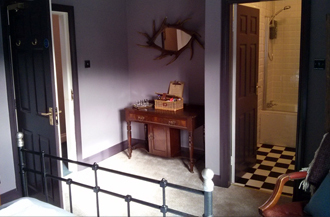 The Pink Room has a Double bed with crisp cotton bedding and en suite bathroom with an over bath shower. Our rooms have a flat screen TV’s and tea and coffee making facilities.